Admit it: The ruckus surrounding the Steven Slater incident is starting to wear thin. We now know what brand of beer he grabbed before he slid to infamy (Blue Moon—a respectable choice). Passengers are offering wildly conflicting accounts of what actually happened onboard. The real coup de grace is that Slater is apparently mulling over a reality TV offer. All of this is fun media fodder, but means little from a traveler’s perspective. The gist of the article is that the shine has worn off JetBlue’s brand, and that the Slater incident highlights just how regular the airline has become. Ten years after launching with innovative features such as seatback TVs and leather seats in coach, AdAge argues JetBlue has sagged under market pressures and a strong competitive environment. In some respects—in-flight Wi-Fi is a glaring example—JetBlue has fallen behind the curve, especially when compared to start-up Virgin America and all its JetBlue-esque bells and whistles. Of course, what JetBlue currently is really isn’t that bad. Its coach-class product is still considered tops in the industry. Its customer service reputation remains strong. Its fleet is young. Fares are reasonable. Fees are tolerable. I don’t think JetBlue has become just another airline, nor do I think the Slater incident reflects on JetBlue’s corporate culture specifically. The airline industry, like any business, is full of people who have simply had enough. Slater’s outburst seems symptomatic of the stresses of the job, namely long hours, rude passengers, and, in many cases, poor pay and fragile job security. Slater may have his own gripes with JetBlue itself, but I doubt they’re different from what you’d find at other carriers. Still, I think it’s wise to phrase Slater’s actions as a “wake-up call.” JetBlue is still an industry leader in terms of customer service, in-flight amenities, and value. If it has fallen short of expectations of late, it’s only because it set the bar so high to begin with. And yet, it’s a quick slide to the middle of the pack. As Virgin America grows and other airlines adopt JetBlue’s best ideas, the quirky airline may quickly find itself anonymous. Readers, do you think the Slater incident reflects poorly on JetBlue? 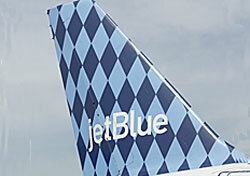 Do you think JetBlue has slipped in recent years? Or do you think it still leads the way in terms of quality and value?